It is a very convenient and practical product.Two outlet socket adapter and one light holder with the pull chain switch perfect for working in anyplace. Quality Guarantee,Two year warranty. Please feel free to contact SERBION after-sales directly if you have any questions or suggestions. ❤E26 to E26 the US Standard Screw Light Holder with 2-Prong Cord Outlet Socket Adapter,Bakelite Plastic& Metal material composition, Black. ❤This adapter comes with Pull Chain Switch ,One Light Holder:250W-125V,Two Outlet Socket Adapter:660W-125V. ❤UL Listed, Easy to Install,Plug and Play,insulation Flame retardant Heat resistant, No fire hazard, Max 250℃ heat resistant, corrosion resistant,Durable. 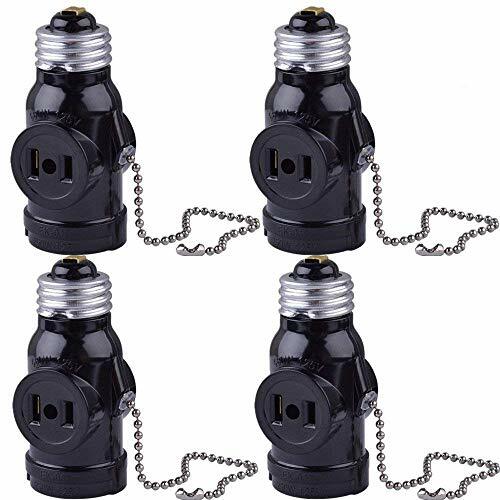 ❤Convenient and Practical:The outlet have power to it when the light is turned off.The chain 0.5 inches length, it can be lengthened.Extensive application:Work well in anyplace where you need an extra plug and lighting. ❤Satisfaction guarantee: Two Year Warranty-Quality Guarantee. If you have any questions about this product by SerBion, contact us by completing and submitting the form below. If you are looking for a specif part number, please include it with your message.